MAN, was this a difficult strip to write! Every once in a while I run into an idea that seems good at first, but when I put it together, I realize it doesn’t work. Then I change it up… and again… and again… until the final draft is almost a completely different idea. It’s an interesting exercise in writing, but it’s highly stressful. Anyways… I’m done with it now. WHEW! BTW John. Do you use any image manip program? I draw everything in Manga Studio, if that’s what you mean. I think this turned out well. 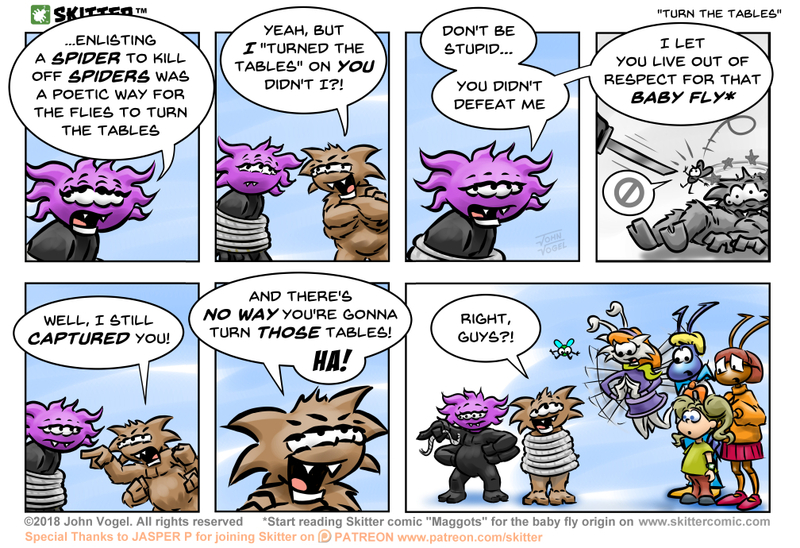 BTW, you should link the other strip in your commentary, so it’s clickable. Glad you like it! And, yeah, I’ll link the other strip. Can’t believe I didn’t already do that. Thanks! If a table turns, is it more of a Lazy Suzan?